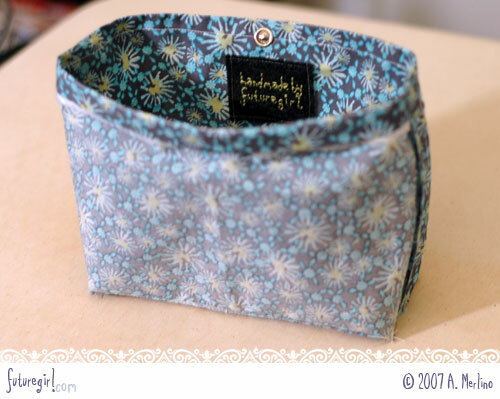 This tutorial can be used to sew a fabric lining for any kind of bag that is either flat or has a boxy shape. Once you're done, you can use my tutorial for sewing the lining *into* a crochet bag to put everything together. 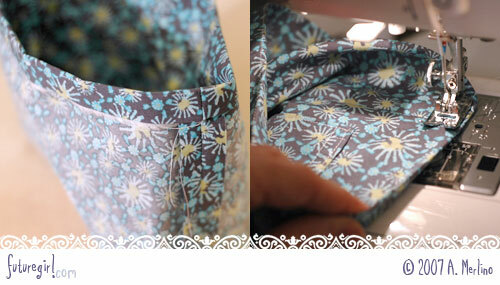 1) Measure the flattened, unlined handbag and fill out a lining worksheet. 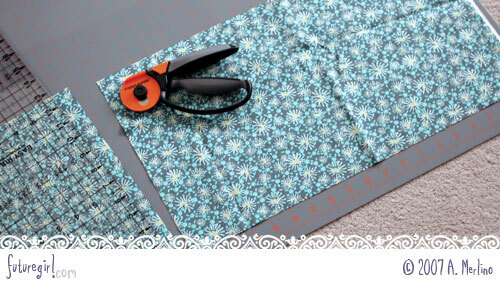 2) Cut fabric for lining according to lining worksheet dimensions. 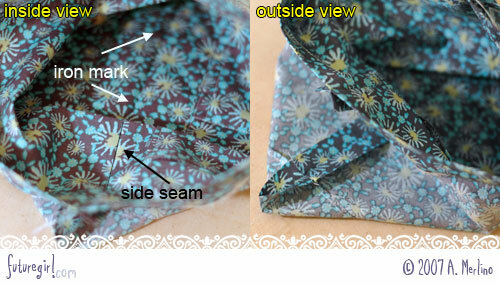 3) Fold lining in half, right sides together, and iron fold. 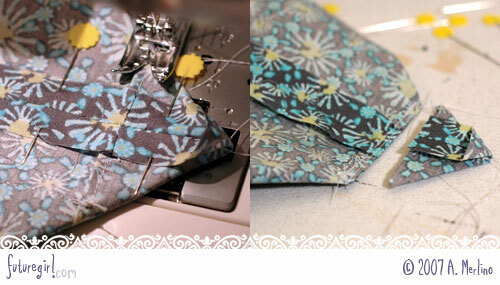 4) Sew 1/8" seams on both sides of the handbag lining's bottom. Skip this step if your handbag is flat and has no bottom. 5) Fold top edge over so the fabric is wrong sides together and iron fold. 6) Unfold top fold, and sew 1/2" seams up both sides. 7) Press side seams open. 8) Square the corners of the handbag bottom. 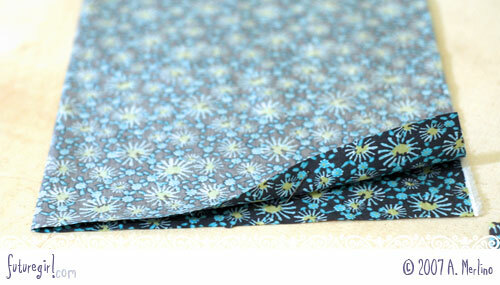 9) Fold down the top fold, and sew 3/8" seam around the top edge. 1) Measure your flattened, unlined handbag. I measure the width (W) on the outside and subtract 1/4". I measure the depth (D) on the inside from the middle of the bottom to exactly to the crochet row to which I will be sewing the lining. The bottom (B) measurement is how wide you'd like the flat bottom of your bag to be. I measure this on the inside the handbag with a tape measure while I eye-ball where I think the corners of the bag should be (this isn't shown). Take those measurements and fill out a lining worksheet. 3) Fold lining in half so the fabric is right sides together so the two "width" edges are touching each other and the two "height" edges are folded in half. Iron along the fold. 4) (Skip to step 5 if you handbag is flat.) Lay your fabric on your ironing board right side up and put a pin where the iron mark is. 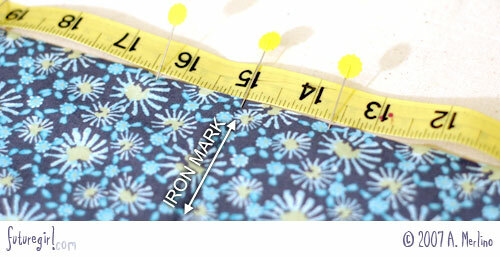 Use your tape measure to put pins on the right and left of the iron mark using the lining worksheet's bottom seam edge measurement. Do this on both sides. 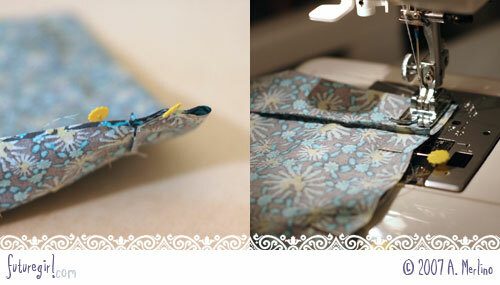 Fold the fabric to the left, using the pins as a guide, and iron along the fold. Do the same thing to the right. After you iron both edge folds, pin them and sew a 1/8" seam along both folds. 5) Lay your fabric on your ironing board wrong side up and measure from the bottom seam to the top fold using the lining worksheet's top fold measurement. Pin top fold and iron. Let the ironed fold cool before you unfold it. 6) Unfold the top fold. Fold the lining in half just like you did in the first step taking care to line up the bottom edge seams and the top fold iron marks. Pin both sides and sew a 1/2" seam up both sides starting at the bottom fold and going toward the top edge. 8) Square the corners of the handbag bottom. Start by standing the lining up with the bottom on the table and all the sides up, as if it were inside the handbag. Fold the side seam down into the handbag and line up the side seam with the iron mark in the middle of the handbag bottom (inside view). 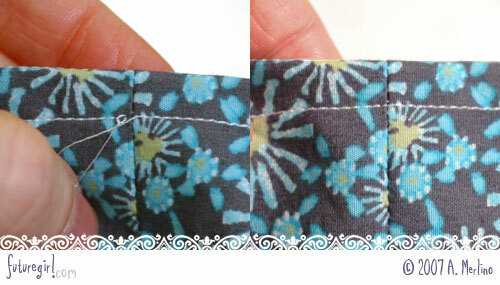 Pin the outside corner on either side of the bottom edge seam. (outside view isn't pinned yet). Repeat for other side. The bottom edge seams will make a straight line across the corner where you should sew to square the bottom of the lining. After sewing, cut off the corner. 9) Fold down the top at the iron mark making sure you keep the side seams pressed open. Iron the top fold again if the iron marks are not sharp. Pin top fold and sew a 3/8" seam around the top edge starting in a side seam. When you finish, thread both sewing machine threads on a needle and pull to the back through the seam. Tie them to the threads on the back side of the lining. I love this trick so much. Look how perfect that seam looks! Here is the finished lining. You can customize it however you'd like. I prefer to add pockets, a snap, and a hand embroidered label. As always, I'd love to hear what you think of this tutorial. Especially let me know if anything is confusing or wrong.